Need help with grc? Click here to learn more about Tallyfy. 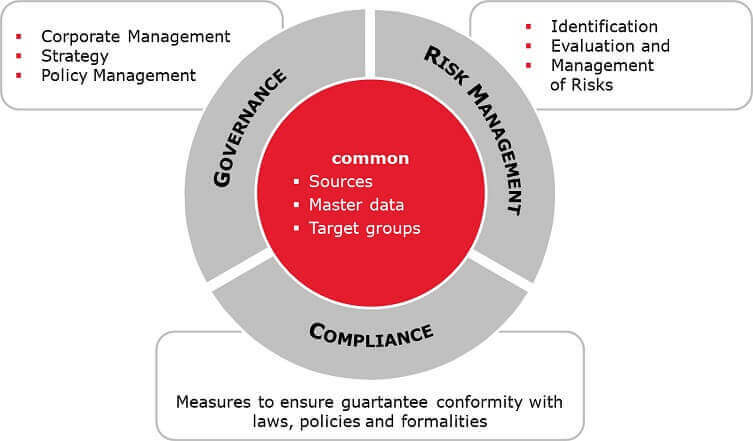 Governance, Risk Management and Compliance, also known as GRC, is an umbrella term for the way organisations deal with three areas that help them achieve their objectives. The main purpose of GRC as a business practice is to create a synchronized approach to these areas, avoiding repetition of tasks and ensuring that the approaches used are effective and efficient. This GRC guide is here to help you learn more about it and what you can do to pplement the right processes in your business. As the name suggests, this looks at the way companies are managed at the highest levels, including the mechanisms, processes and relations that allow for smooth allocation and understanding of the rights and responsibilities of the various decision makers within the business. Every aspect of every business has the potential for risk, whether it’s a risk to reputation, health & safety, financial security, etc. It’s nearly impossible to avoid risks and certainly very difficult to do so whilst also achieving successes, so risk management is the set of processes that identify, analyze and respond appropriately to each potential risk. Managing risks is one thing but it’s possible for multiple conflicting risks to occur, leaving a business having to decide between minimizing the risk to safety or minimizing the risk to profits, so it’s necessary to ensure that the right decisions are always made. This is where compliance comes in, with businesses needing to comply with various standards, laws, regulations, etc, to avoid the penalties that result from non-compliance. This GRC guide will tell you all you need to know about how your business can benefit from bringing these three areas together under this one discipline. An obvious and understandable reaction to the idea of bringing in yet more corporate processes and procedures would be to wonder if this isn’t all just yet more red tape and bureaucracy. However, GRC isn’t about adding to the complexity of already-overstuffed processes, but to help condense and clarify them to enable smooth running. But what are the main benefits of starting to utilise GRC capabilities? Cutting costs – The integrated approach of GRC often brings real financial benefits as unnecessary spending can be cut, while the clearer focus can help boost revenue at the same time. The bigger the business, the more likely it is that there will be plenty of areas where there is crossover and wastage, so a process like this can transform efficiency. Less duplicated work – This is where most of the cost-cutting can be made, but it’s about more than just the money. 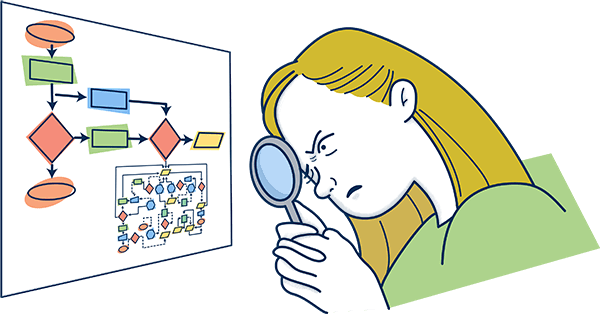 Having similar processes duplicated across a business is a hugely inefficient way to operate and GRC can free up whole teams to work on other projects. Less negative impact – Having too many procedures, especially ones that aren’t working in a logical manner, can waste a lot of time for staff across a business. Tying everything together in an GRC strategy cuts down on the paperwork and bureaucracy, which will boost your staff’s productivity, not to mention their morale. Greater information quality – A more centralized and consistent approach to governance, risk management and compliance helps to not only speed up the processes for gathering the necessary information, but also improve the quality of what is gathered, helping decisions be made more rapidly and with greater confidence. More ability to repeat processes – Another huge benefit is that processes can be standardised across these areas, allowing for them to be repeated more easily and with greater consistency and efficiency. Reputation security – Risk management and compliance are both essential parts of any attempts to secure your business’s reputation, so it goes without saying that managing these aspects more efficiently provides a more effective method of reputation security. Better allocation of resources – Getting more information and understanding more about areas that are duplicating work can help determine the most effective directions for your business to go in. No more silos – Any large business has numerous issues with staff working in ‘silos’ where information doesn’t flow in or out in a productive manner. GRC won’t completely eradicate these issues, but it will certainly minimise their potential impact on key areas. So you’ve been won over by the benefits listed above? Then it’s time to start thinking about how you can introduce GRC to your business in a way that will maximize the positive impact and minimize any potential disruption in the implementation period. This GRC Guide is here to spell out; the people you need to have involved, what their roles need to be and and the steps you need to take to make GRC strategies and tools work for you. The simple answer to the question of who needs to be involved in a successful adaptation of GRC is ‘everybody’ as there are elements of governance, risk management and compliance (particularly the latter two) which go from the very top of an organisation down to deep within business units and teams. A CEO cannot possibly have the knowledge and responsibility for all matters involving risk management and compliance, there’s simply too much going on, and even management of them needs to sit with business unit managers as well as specific compliance officers. This paragraph alone should hopefully give an indication of how complex the chain of command can be when it comes to GRC, and the need to keep things as simple as possible, not to mention highlighting how incredibly over-complicated existing structures might already be. Of course, this will vary depending on the size and complexity of your business, but what is consistent across all shapes and sizes is the need for effective collaboration and communication and the need for all involved to be aware and mindful of the bigger picture rather than simply their role in it. From the top down, the benefits of GRC need to be communicated as part of a change management strategy to ensure that everyone has bought into the need and expected benefits. CEO/Board level – Anyone in a role at this level needs to able to provide strategic oversight and decision-making capacities along with timely and clear communication down the chain to enable colleagues to fulfil their roles effectively. Finance chiefs – Whoever has overall responsibility for the financial operations of a business has a large part to play in GRC implementation, not least when it comes to spelling out the financial drivers for the changes. Risk managers – Any large organisation should already have people at managerial level who are responsible for risk management and their roles in GRC are extensive. They need to identify threats (and opportunities) and come up with strategic responses to minimize the risks to the business, as well as being responsible for the ongoing monitoring. Compliance officers – Similarly, anyone with responsibility for compliance need to be involved in all planning decisions, driving forward strategies that help the business meet the requirements needed for standards, laws, etc. HR managers – When it comes to how GRC is implemented across the business and communicated to staff to ensure buy-in, much of this responsibility lands within the remit of human resources. Without an effective HR department, any kind of major strategic overhaul like this is doomed to fail. IT managers – They are responsible for whatever technological solution is bought in or developed to meet the needs of the GRC strategy and will certainly need to be involved in the decision-making process. They will also be responsible for the way information is gathered across the business and how is it delivered where it is needed. Define what you aim to achieve – If this sounds like an obvious step, it’s because it is. However, it’s a step too often overlooked and one that can make all the difference between success and failure. After all, if you don’t know what you want to achieve and whether your new strategy can even help you get there, how can you possibly hope to effect any meaningful change? The key here is to gather key stakeholders and project staff together to understand collectively what GRC can mean to your organisation and to come up with priorities based on that understanding. Take stock of your current situation – You have clarified what GRC can mean to your organisation, but another key step is to understand what is currently happening in the fields of governance, risk management and compliance before you change anything. A survey of your regulatory activities will not only give you a better understanding of what you will gain from GRC but also any other weaknesses that can also be addressed that had previously been out of the scope of the project. Pick a trial entry point – It is certainly possible to jump straight into rolling out GRC across all of your business’s operations, and for smaller companies that is the only option really, but the ideal scenario would be to pick a test subject. If you can identify an area that will benefit from GRC and can focus your energies on implementing it there first, there will be learnings that can be incorporated in the gradual roll-out. Demonstrate the benefits – With the approach above, there’s also the potential to gain some early wins that can help with the internal communications aimed at winning buy-in from staff. It’s not just a case of heading off the confusion and lack of support that can result from a poorly communicated change like this, it’s about demonstrating to key staff and managers the clear benefits of GRC, covering subjects like the drivers for it, the implication on staff, the controls in place and the next steps. Define what would represent success – This is one of the most important steps because defining what would represent success is the way that you can demonstrate that the project has been worthwhile. Out of the benefits listed earlier, pick out the ones that are most relevant and put a number by them, whether it’s a financial target or one based on policies and procedures that be measured to show that GRC is making things better. If you can work through these five steps and document the findings, you will have most of the information you need to be able to move forwards with GRC from a position of knowledge, research and authority. The process will always be ongoing, meaning that there will always be more to learn, so the steps from this GRC Guide can and should be repeated each time. Do your research – Make sure you understand what you are buying if you are purchasing a product to manage GRC, because if it doesn’t completely do what you are expecting of it, you will be wasting money and creating extra work for yourselves doing something that is meant to minimize expenditure and workload bloat. Most of all, understand what GRC represents and what the impacts of it will be, as well as what needs to be put into it to get the right results out of it. Take an iterative approach – Good advice for any major corporate strategy change, it applies just as well with GRC. There is no way to get it 100% right the first time out as there are too many factors and stakeholders involved, opening up the likelihood of needing to revise and revisit aspects over and over again. So it’s best to plan ahead for this, especially given the nature of risk management and compliance, both of which need to be monitored and revisited on a regular basis as a matter of course. Work collaboratively – The project team for GRC implementation needs to be a diverse one in terms of representing all of the various roles mentioned above, otherwise the decisions made will not be representative and may not achieve everything they are intended to achieve. It also ensures that developments are communicated around everyone who needs to know and avoids work being duplicated – which is one of the main points of introducing GRC in the first place, of course. Communicate – As previously mentioned in this GRC Guide, good communication across the business is critical to avoid colleagues misunderstanding the nature of GRC and what it is being brought in to achieve. This is especially important when it comes to the areas of the business where workflows will be directly affected, particularly those where there might be staff changes to reflect the more streamlined approach. GRC is meant to be a positive step in the right direction, but poor internal communications can turn it into a potential – and completely unnecessary – problem. Prepare and provide the right resources – Another potential issue could be that the GRC solution is seen as an easy win when it comes to cutting costs and so the right financial and staffing resources aren’t put into place to manage it at the early stages. As well as making sure these resources are available, the planning needs to be in place for how to properly utilize them. If you’d like to find out more about how Tallyfy can help your business manage GRC processes, we will prepare a customized demonstration for you. It’s absolutely free and we can help you transform your business for the better, so what are you waiting for?